You will love our colorful design and ideal location within Mangga Dua Square mall! For your leisure or business trip, our happy mood makers team can't wait to welcome you! ibis Styles Jakarta Mangga Dua Square is a stylish economy hotel with unique and vibrant design. Our 211 dynamic rooms allow the guest to sleep with comfort, while enjoying affordable culinary selections at Streats Restaurant. The hotel is 5 minutes to Jakarta Kota Train Station, 10 minutes to JIExpo Kemayoran or Ancol Dreamland and 30 minutes to Soekarno-Hatta Int. Airport by car. For meeting and event, we provide 3 Milkyway rooms that can be combined into a large ballroom for 500 delegates. You are looking for a hotel in Jakarta for leisure or busines? 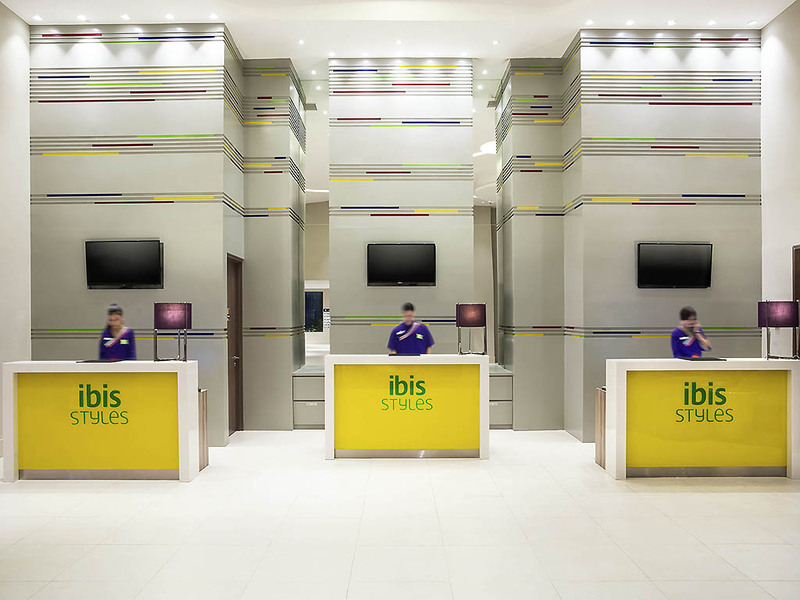 ibis Styles Jakarta Mangga Dua Square serves as a convenient base to explore the city. Close to Business Centre and Near Harbour to explore the tropical atmosphere of Thousand Islands . The hotel is equipped with its newly rejuvenated Olympic size swimming pool to provide a better stay experience for our beloved guests. Each of the 210 rooms at ibis Styles Jakarta Mangga Dua Square feature a separate bathroom with shower, LED TV, in room safe, hair dryer and free WiFi access. Enjoy a wide variety of international cuisine and local hawker delights at our restaurant. Besides all the above mentioned good points. The only dissatisfaction is that toilet without water hose, in case customer diarrhoea all over the toilet bowl that is no water hose for him/her to wash it immediately, we don't demand for a built-in water washers but at least a built-in water hose for easy to clean up toilet bowl after heavily used.For hygiene purposes if possible let customer has a choice to change/wash pillow case. Nice and simple room. Table too small. actually it is a good hotel, but I can't find any signal in the hotel. And the toilet room Is so small, so it's kinda hard for me to move in there, and please give a shower in the toilet. This is the first time we stayed at this hotel, the experience we felt was truly satisfying. From the moment we surveyed to our reservation we were served very well by Mr. Yohanes. When checking in to the hotel we were helped by Ms. Dea very kindly. While at the Lobby we also met Mr. Nugroho who greeted us very kindly. What a pleasant service. Location is excellent. Staff are friendly. Hotel is comfortable. Breakfast is suitable. Close to transport, shops, convenience stores. There are plenty of restaurant and convenient store outside the hotel. Very friendly and always ready to help and the room was great and clean. In addition free Wi-fi is available. Extremely Satisfied, but bad ending destroy it all..
At first i was so satisfied, the checkin is good, the front office is kind and help, the room was nice, anything is good, but when in the morning i was check out incident happen, i asked the front office to inform the security downstairs, to inform me when about the public transportation ready to depart from hotel to airport while i take my breakfast, and then they said &quot;OK&quot;. In 10 minutes i finish and hurry to go down. And when i go down then the nightmare come, they not informed me anything upstairs and now the public transportation already depart minute ago, and they said i must wait for another hour.. anyway i cannot wait for another hour cause i will be late, so i must find and took a cab and hope that i arrive on time at the airport. Dear Valuable Guest, Thank you for visiting ibis Styles Jakarta Mangga Dua Square and gave us a rating. From your overall score, we regret to know that your experience did not meet your expectation. I would share your rating with all of our team as an encouragement to improve our quality and service. It was certainly a pleasure for us to be at your service and we all look forward to welcoming you again soon. Sincerely, Lidiya Oktaviani, Asst. Guest Experience Manager. Room is adequate in size, clean and well-maintained. Breakfast variety was also good and there is easy access to convenient stores downstairs. Sir, the whole experience was superb, except for my credit card was swiped, irrespective of the deposit paid in full by cash in Indonesian currency. Am awaiting reversal of charges now, since my account here has been debited already. Please lòks into. But, I must appreciate your staff very courteous attitude and ready to help all the times. Thanks and look forward to staying with IBIS again. When open or closing toilet glass door, there was sound as kind of spoilt (room 9419), not good. Overall, it was a good stay. Check in process was fast, accurate and hassle free. breakfast was a little disappointed. Overcrowded. No proper seating arrangement. The toilet was smelly at some of the times, I also thought that I didn’t get enough light during my stay in the room, didn’t know whether it is just supposed to be like that or there was something wrong but ya thats ok.
Dear Valuable Guest, Thank you for staying at ibis Styles Jakarta Mangga Dua Square and share your experience. Indeed, strategic location which near to shopping center and also local attraction is one of the best parts when you stay in our hotel. If you want to go to Ancol beach it will take 5 minutes by taxi and 40 minutes to Soekarno Hatta International Airport. Furthermore, it was certainly a pleasure for us to be at your service and we all look forward to welcoming you again soon. Sincerely, Lidiya Oktaviani, Asst. Guest Experience Manager.